The economics of producing only electricity from residues, which comprise of surplus bagasse and 50% post-harvest residues, at an existing sugar mill in South Africa was compared to the coproduction of ethanol from the hemicelluloses and electricity from the remaining solid fractions. Six different energy schemes were evaluated. They include: (1) exclusive electricity generation by combustion with high pressure steam cycles (CHPSC-EE), (2) biomass integrated gasification with combined cycles (BIGCC-EE), (3) coproduction of ethanol (using conventional distillation (CD)) and electricity (using BIGCC), (4) coproduction of ethanol (using CD) and electricity (using CHPSC), (5) coproduction of ethanol (using vacuum distillation (VD)) and electricity (using BIGCC), and (6) coproduction of ethanol (using VD) and electricity (using CHPSC). The pricing strategies in the economic analysis considered an upper and lower premium for electricity, on the standard price of the South African Energy Provider Eskom’ of 31 and 103% respectively and ethanol prices were projected from two sets of historical prices. From an energy balance perspective, ethanol coproduction with electricity was superior to electricity production alone. The VD/BIGCC combination had the highest process energy efficiency of 32.91% while the CHPSC-EE has the lowest energy efficiency of 15.44%. Regarding the economic comparison, it was seen that at the most conservative and optimistic pricing strategies, the ethanol production using VD/BIGCC had the highest internal rate of returns at 29.42 and 40.74% respectively. It was shown that bioethanol coproduction from the hemicellulose fractions of sugarcane residues, with electricity cogeneration from cellulose and lignin, is more efficient and economically viable than the exclusive electricity generation technologies considered, under the constraints in a South African context. Sugarcane processing industries in Southern Africa generate bagasse at a yield of 0.30 tons per ton of cane processed . In most sugar mills in Southern Africa, the generated bagasse is mostly burnt to provide heat and electricity for the sugar milling operations [1, 2]. South African sugar mills (from crushing to raw sugar production) typically have poor efficiency and the average steam demand is 0.58 tons per ton of sugarcane processed  (58% on cane). When such process designs are coupled with low efficiency biomass-to-energy conversion systems, then no surplus bagasse is generated by the sugar mill and therefore no export of electricity occurs [4, 5]. If efficient sugar mills that have steam demands below 40% [5, 6] are coupled with efficient systems that convert biomass to energy , then excess bagasse becomes available. This excess, if combined with other post-harvest residues like sugarcane trash, could provide the feedstock for the production of bio-energetic products in an integrated facility. The costs associated with the utilization of such residues would include the cost of collection and transport, and the investment costs required to upgrade the energy efficiency of existing sugar mills to enable the liberation of surplus bagasse. These costs are significantly lower than the purchasing costs of biomass  that hinders the economic viability of ‘stand-alone’ facilities for biomass conversion to energy . The low efficiency biomass-to-energy systems in older cane milling operations utilized combustion systems that had raised steam to pressures of between 15 and 22 bar [5, 9]. Such systems also provided a low cost means of disposing of bagasse [1, 9] at a time when exporting electricity was not economically interesting. For that means, combustion with high pressure steam cycles allowed for greater turbine efficiency in the conversion of steam to electricity and thus, pressures of 82 to 85 bar [1, 10] would have typically been preferred. At a pressure of 60 bar, it has been shown that a net electricity export of 72 kW (per ton of cane processed per hour) was possible for an efficient sugarcane mill, where a steam demand of 0.4 tons per ton of cane was required . This amount of export electricity could have been increased substantially if the harvesting residues (trash) was also considered [5, 7, 11]. The electrical efficiencies resulting from biomass power plants utilizing combustion and high pressure steam cycles are reported to be between 23 and 26% on an HHV (Higher Heating Value) basis [12, 13], while efficiencies reported for Biomass Integrated Gasification and Combined Cycles system (BIGCC) were at 34 to 40% . The implementation of BIGCC in industry has been limited due to the reportedly high capital investment that is required [12, 13, 15]. The capital estimates of BIGCC systems in previous techno-economic assessments [12, 13, 16] however, were based on the estimates in a period where BIGCC technology was still new (1990 to the early 2000s) , and thus, capital estimates based on the vendor quotes in this period would have reflected the pioneer plant costs. A capital estimate based on a matured estimate could be significantly lower than the pioneer estimate . As an alternative to the conversion of all of the available lignocellulose residues to electricity, a fraction of the bagasse and post-harvest residues could be used to produce ethanol, with co-generation of electricity. The hemicellulose, which makes up about 20 to 35%  of the biomass matrix, can be solubilized by steam explosion or dilute acid hydrolysis and converted to ethanol, while the remaining cellulose-lignin fractions are converted to heat and power [20, 21]. This scenario for the coproduction of ethanol and electricity from lignocellulose has been proposed for the South African industry , but a detailed process flow sheet and techno-economic investigation of such for existing sugar mills is not available. Of particular interest would be the techno-economic comparison of coproduction of ethanol and electricity against a scenario where the residues are used exclusively for electricity generation. Previous studies have compared electricity generation alone with the complete lignocellulose conversion to ethanol (hemicellulose and cellulose) as options for integration with sugar mills  and autonomous distilleries [7, 11]. The ethanol generation scheme in this study builds on the concept of ‘value prior to combustion’ that has previously been evaluated as a green-field (stand-alone) scenario . There has been a considerable success in developing microbial strains that efficiently converts pentose-rich hydrolysates to ethanol , which is the key area of importance if the proposed technology is to be feasible. Using adapted strains of a the native pentose fermenting yeast Pichia stipitis, Kurian et al. converted 82.5% of the hemicellulose sugars in a hydrolysate derived from sorghum bagasse that contained 92 g/l of dissolved sugars, while Nigam  converted 80.0% in an acid hydrolysate from wheat straw, containing 80 g/l sugars. The development of robust recombinant strains, such as the Saccharomyces cerevisiae TMB400, have resulted in pentose conversions in excess of 85% in toxic environments in simultaneous saccharification and fermentation experiments . More recently, the National Renewable Energy Laboratory (NREL) achieved an ethanol yield of 92% on hemicellulose sugars in a toxic enzymatic hydrolysate that contained a total of about 150 g/l of sugars, using the Zymomonas mobilis strain that was genetically engineered by Du Pont . Thus, fermentation technology for converting pentose sugars in hydrolysates to ethanol has been successfully demonstrated on a laboratory scale. The present study provides a detailed techno-economic comparison of scenarios that entail ethanol coproduction with export electricity, produced either by combustion or BIGCC systems, against those that produce only export electricity using the same systems. For either scenario, the upgrading costs of the existing sugar mill to achieve an energy efficiency of 0.40 ton of steam per ton of cane, is included in the capital investments considered in the economic analysis. The development of process models for the ethanol coproduction scenario will be based on established flow sheets and process performances for lignocellulosic ethanol [28, 29], and will also consider various processing options to ensure the most energy efficient and economical flow sheet. The projects are assumed to be in Kwa-Zulu Natal where the sugar cane crushing plants are concentrated. All South African legislations would apply. Energy efficiency for all of the scenarios will be maximized through pinch point analysis (PPA) for the heat integration of the processing streams [30–32]. This approach will ensure that the energy utilities for ethanol production are kept to a minimum [29, 30], consequently maximizing the export electricity while still providing the energy requirements of the (energy efficient) mill . From the process simulations (mass- and energy-balances) for the various scenarios economic evaluations, incorporating capital and operational costs as well as sales prices, will be performed from an economic risk perspective [34–37]. These methods are based on Monte Carlo simulations that are super-imposed on standard methods for process economic methods, in order to account for the risks associated with the fluctuations in economic variables, thereby providing not only the estimates for investment returns, but also the probability of achieving economic success. Six scenarios for the production of electricity from sugarcane residues, either as the only energy product or with coproduction of ethanol from hemicellulose, were evaluated through process modelling to estimate process energy efficiency and economics. The results of the energy characteristics for the various process alternatives that have been optimized by pinch point analysis are presented in Table 1. Furthermore, the amount of steam generated by the heat and power facility in each scenario, whether this facility forms an exclusive electricity scenario or an energy generation section of an ethanol coproduction scenario, is presented. If the facility utilizes the Combustion with High Pressure Steam Cycles (CHPSC) technology, then the gross steam generation refers to gross amount of steam generated by the biomass-fired boiler. If the heat and power plant utilizes the BIGCC technology then the gross steam generation refers to the steam generated by the heat recovery steam generator (HRSG) that recovers heat from the gas turbine’s exhaust. The steam contingency refers to the amount of steam that is reserved once all the demands of the sugar mill and ethanol plants (in the case of ethanol coproduction scenarios) are met, and is essentially an indication of the operating leeway the scenario offers in terms of meeting steam when fluctuations in the plant occur. According to Pellegrini et al. , the maximum fluctuation of the steam demand in a sugar mill was measured at 2%. The ethanol production rate of all the coproduction scenarios averages 9591 l/hr, which would equate to 62 million liters per annum. Given that the total consumption of road transport fuel in South Africa is about 23 billion liters per annum , this production rate would represent 0.27% of road transport fuels. This production rate equates to an ethanol yield of 35 liters per ton of cane crushed, where the hemicellulose fraction of the bagasse and 50% of the trash generated is converted to ethanol. With regards to the exclusive electricity generation, the BIGCC-EE and CHPSC-EE (EE - exclusive electricity production using BIGCC and CHPSC respectively) scenarios generated 88.63 MW and 53.43 ± 2.43 MW of electricity (MWe) respectively. Given that the total output of electricity supplied to the national grid is 34 GW , then the contribution to the grid would be 0.22% and 0.13% for the BIGCC-EE and CHPSC-EE respectively. The coproduction of ethanol with electricity from sugarcane residues available at sugar mills would reduce the potential electrical export by approximately 54% on average. With regards to the steam generation and demand, it is seen that the gross generation of steam in the BIGCC-EE process is 32.86% less than the amount of the CHPSC-EE process, primarily because BIGCC technology is meant to maximize electricity generation, rather than steam generation. The steam generated by the heat and power generation facilities of the ethanol coproduction scenarios are 28.4% lower when compared to their exclusive electricity counterparts. The major implication of this reduction for steam generation was that when BIGCC technology was coupled with ethanol coproduction, the combined steam demand of the sugar mill and the ethanol generation process exceeded the steam generated. This penalized the electricity generated by the ethanol-BIGCC scenarios, as electricity was needed internally for heating purposes, at a rate of 2.43 MW and 15.63 MW for the VD/BIGCC and CD/BIGCC respectively. Thus, the vacuum distillation scenarios offered a more feasible operating scenario when BIGCC technology was considered, as the lower steam consumption minimized the electricity consumed for heating purposes. A further comparison of vacuum and conventional distillation shows that the application of vacuum distillation allowed for an extra 1.36 MW of electricity to be available for export (comparing CD/CHPSC and VD/CHPSC). This was because the lower steam demand of the vacuum distillation system on the steam utilities allowed for more steam to expand through the exhaust steam turbine of the condensing extraction steam turbine (CEST). Furthermore, the multi-effect system also relieved the cooling duty of the condenser of the rectifier column, and thus, no further electricity was needed to deliver this cooling duty. So even though there was an additional process electricity requirement for the vacuum pump that actuated the multi-effect distillation, the reduction in utility requirements exceeded the requirement, which then resulted in a net positive electricity export. The energy efficiencies reported in Table 1 were based on the net export of the bio-energetic products, which is the ethanol sold and the electricity exported to the grid after the mill requirements were accounted for. 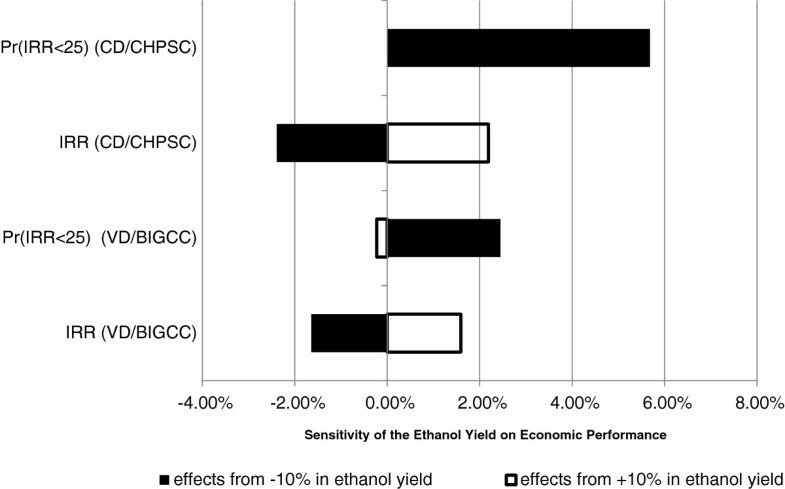 Generally, ethanol scenarios with BIGCC technology had the greatest net export efficiency, followed by that of the BIGCC-EE, which was comparable to the ethanol-CHPSC scenarios, and the lowest being the CHPSC-EE scenario. The reduction in steam consumption in vacuum distillation when CHPSC and BIGCC technology are used for energy generation is shown to improve the export electricity efficiency by 0.41% and 3.74% respectively. The improvement when BIGCC technology was integrated with vacuum distillation is explained by the lower amount of electricity consumed internally for heating purposes. The lowest export energy efficiency was attained by the CHPSC-EE scenario, due to the large amount of exhaust steam still present after the steam demand of the sugar mill was accounted for. The energy contained in this steam is mostly spent to the environment by the surface condenser. If a biomass dryer was used to de-moisture the biomass prior to combustion, as in the case of the CHPSC-EE, then the export efficiency improved by 1.42% because the steam and electricity generation had improved by 6.14% and 7.65% respectively. In order to assess the benefits of pinch point analysis (PPA), values in Table 1 are compared with the corresponding values in Table 2. Table 2 does not report values for the exclusive electricity scenarios because effective heat integration is implicit in the overall design of these processes. Regarding the CHPSC-EE, the design of Nsaful et al., which is the source model for the CHPSC technology, was already optimized with PPA. As for the BIGCC-EE, PPA confirmed the heat integration strategies that have previously been implemented, such as the cooling of the syngas to heat up air for the gasifier, improving steam generation, and also using the inter-cooler duty of the multistage compressor to improve steam generation . The comparison between Tables 1 and 2 shows that the potential for exporting electricity from the ethanol-BIGCC scenarios are reduced by a margin of 30 to 38% if PPA is not applied, mainly because the increase in steam demand resulted in more electricity consumed for heating purposes. Thus, the primary advantage of PPA is the reduction of steam and electrical utilities, which then resulted in the net export of more electricity, and the general improvement in the export energy efficiencies by 0.98% and 3.99% for ethanol-CHPSC and ethanol-BIGCC scenarios respectively. The effect of PPA on the scenario employing conventional distillation seems more apparent because the vacuum distillation already affected a substantial reduction in utilities by inducing multi-effect distillation. The six scenarios for the production of electricity from sugarcane residues, either as the only energy product or with coproduction of ethanol from hemicellulose, were compared in terms of the total capital investments (TCI) required (Figure 1), the economic viabilities in terms of internal rates of return (IRR) on the investments (Figure 2), and the financial risk of each investment, based on the Monte Carlo simulation, quantified as the probability of an acceptable return on investment (Figure 3). Figure 1 shows that the highest capital investment was 324.57million US$ for the VD/BIGCC cogeneration scenario, which was also the scenario with the highest energy efficiency. The primary reason for the high capital investment is the costs associated with the integrated BIGCC, as shown by the difference in capital costs between the ethanol scenarios with vacuum distillation that have either the CHPSC or BIGCC technologies integrated as energy islands. The application of the vacuum distillation also demanded higher capital costs, as is shown by the general comparison of the vacuum and conventional distillation scenarios. With VD, additional capital charges were also incurred by the larger capacity of the surface condenser and circulation pumps. This was because of the lower steam demand, which resulted in a greater throughput of steam in the equipment mentioned. Thus, the use of VD is shown to increase the capital expenditure by 9.33% when CHPSC technology is used, and 4.33% when the BIGCC technology is used as energy schemes, respectively. Total capital investment for simulated scenarios. (CD/CHPSC – Ethanol Production with Conventional Distillation with energy generation from pretreatment residues using CHPSC; CD/BIGCC – Ethanol production with Conventional Distillation with energy generation from pretreatment residues using BIGCC; VD/CHPSC – Ethanol Production with Vacuum Distillation with energy generation from pretreatment residues using CHPSC; VD/BIGCC – Ethanol production with Vacuum Distillation with energy generation from pretreatment residues using BIGCC; CHPSC-EE – Exclusive electricity generation from residues using CHPSC; CHPSC-EE (Dryer) – Exclusive electricity generation from residues using CHPSC where biomass is dried; BIGCC-EE – Exclusive electricity generation from residues using BIGCC). Comparison of processes profitability at varies strategies. “Mean IRR” refers to the average of the IRRs determined from each iteration of the Financial Risk Simulation. Evaluation of financial risk at varies pricing strategies. The value on the vertical axis describes the probability to which the IRRs simulated for each scenario will fall below a standard value of 25% for the IRR. The TCI of BIGCC-EE, which was based on a modern estimate , is 28.89% higher than the average TCI of CHPSC-EE. This difference is much less than those attained in previous comparative studies that based the BIGCC capital estimates on pioneer costs. The relative difference between BIGCC and the CHPSC technologies in Dornburg et al. and Bridgwater et al. was about 50% and 77% respectively. The difference in the comparison by Bridgewater et al. had been exceptionally large, since the scale on which the comparison was based was a 20 MWe. Trends shown by Bridgewater et al. and Dornburg et al. have indicated that the difference gets smaller as the scale increases. With regards to exclusive electricity production, it is shown (Figure 2) that the lowest IRRs were attained by the CHPSC-EE scenario, both inclusive and exclusive of the biomass dehydration prior to combustion. The IRRs obtained for the combustion scenarios did not differ significantly from each other, and on average were 22.38% (±0.98%) and 35.20% (±0.97%) at the minimum and maximum premiums on electricity, respectively. In either case, the higher value was obtained when no dryer was considered. Thus, the energy efficiency gained by employing a biomass dryer was not economically justified, due to the increased capital expenditure. The IRR attained by the BIGCC-EE is 7% and 6% higher than those attained by the CHPSC-EE scenario, when the minimum and maximum premiums on electricity were considered, respectively. In previous studies where the capital estimates of the BIGCC technology were based on pioneer quotes, the profitability of CHPSC technology was generally higher [12, 43]. As the capital estimate of the BIGCC technology in this study was based on a modern estimate, it shows that BIGCC-EE became more favorable, which had also been demonstrated by Searcy and Flynn . It was calculated that on average, the ethanol prices projected from Brazilian data were 47% greater than those based on US data, and therefore the overall minimum pricing strategy was the minimum electricity premium for electricity with US-based ethanol prices. At this pricing scenario, the highest profitability of the ethanol scenarios was attained by the VD/BIGCC. 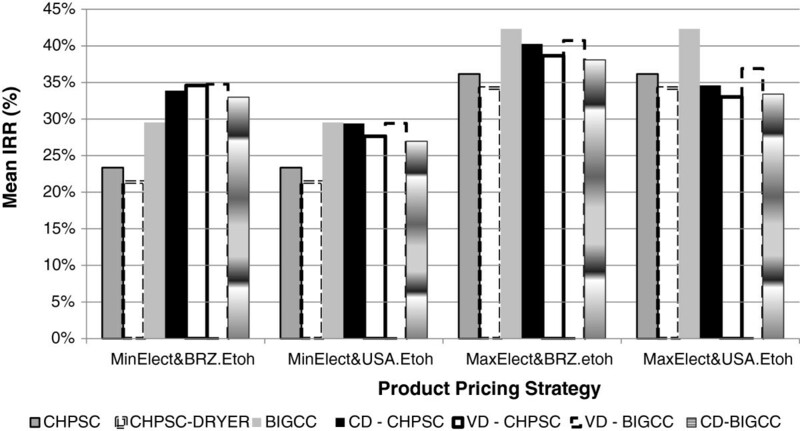 The economic feasibility of integrating BIGCC technology as the heat and power system of ethanol coproduction is advantageous over the CHPSC technology as the profitability of the VD/BIGCC was higher than the VD/CHPSC. This result was expected since the BIGCC-EE was more profitable than the CHPSC-EE when the exclusive electricity scenarios were compared due to the larger surplus of electricity. With regards to the implementation of VD, the IRR of the VD/CHPSC scenario was 1.05% lower than that of the CD/CHPSC, whereas the IRR of the VD/BIGCC was 1.48% higher than the CD/BIGCC. Thus, VD was not justified by the additional capital costs when integrated with CHPSC technology, but was more profitable when integrated with BIGCC technology. Due to the high amount of electricity that was needed for heating purposes in the CD/BIGCC scenario, the IRRs was lower than the VD/BIGCC, even though the capital expenditure was less. When the maximum electricity premium was considered, the IRR of the BIGCC-EE was 1.59% higher than the most profitable ethanol scenario (VD/BIGCC) obtained with the higher (Brazilian) ethanol prices. Under the lower (US) ethanol pricing, the BIGCC-EE was 5.44% higher than the VD/BIGCC scenario (still the most profitable of the ethanol scenarios). Regarding the maximum electrical premium however, the IRRs shown in Figure 2 for exclusive electricity scenarios are well in excess of the standard IRR of 17% that is imposed by the National Energy Regulator of South Africa (NERSA) for independent power producers (IPPs) . In order to diversify the renewable energy contribution of the South African electricity supply (for example, from solar or wind), the prices paid to IPPs are regulated by NERSA to maintain an IRR of 17%, in order to promote equal investment opportunity in the various forms of renewable electricity . Thus, as both the BIGCC-EE and CHPSC-EE are shown to meet this target at the minimum electricity premium, a higher price for electricity generated in the sugar mills would not be allowed. With regards to assessing the scenarios from a financial risk perspective (Figure 3), the maximum occurrence at which the IRR can be less than 25% (which is known to attract the interests of private investors [36, 45]) was a probability of 20% . This qualification of 20% is an extension of a general criterion applied for the maximum probability of the net present value (NPV) being less than zero . At the optimistic pricing scenarios, where high premiums on electricity are considered, all scenarios would be attractive for private investment (Figure 3) when the IRRs are evaluated against the IRR standard of 25%. An evaluation at the minimum pricing scenario showed that all ethanol coproduction scenarios qualified for private investment, since the risks associated with an unfavorable return for private investment were generally less than 1%. The maximum risks were attached to exclusive electricity production involving combustion, as the probabilities of the IRR falling below the standard of 25% were above 80.82% for the CHPSC-EE without drying and 98.96% with drying. The status of the high risk imposed by the exclusive electricity scenarios to private investment would not improve due to restrictions imposed by NERSA on IPPs in respect of the standard IRR of 17%. However, sensitivity in the ethanol prices could allow for private investment that is virtually risk free when coproduction of ethanol is considered, as shown when ethanol prices are projected from the Brazilian data. Under that circumstance, the risks of an unfeasible return for a private investor for all the ethanol scenarios are acceptable, even when the minimum premium for electricity is considered. Since the CHPSC-EE scenario was modelled on the flow sheet of Nsaful et al. , the results of this scenario was validated with the technical and economic results of the scenario using combustion and 82 bar steam cycle, in that study. The export efficiency calculated based on the electrical export of 86.02 kW per ton of cane amounts to 12.70%, which is lower than the export efficiency of 15.44% reported for the CHPSC-EE of this study. The export efficiency of this study is higher because the electricity generation was supplemented with sugarcane trash, which improved the amount of electricity available for export. The IRR reported for the process modelled by Nsaful et al. was 29%, when a bagasse and electricity price of 56 US$/dry ton (data from 2010) and 0.248 U$ per kWhr are considered respectively. Under these conditions, the model in this study yielded an IRR of 41.82%. The optimistic outcome arose because the supplementation by trash improved the export electricity to 170.01 kW per ton of cane processed. Furthermore, the incorporation of trash, which costs just 30% of the bagasse price, reduces the average specific cost paid for biomass in the model of this study to 41.53 U$/dry ton (data from 2010). The BIGCC-EE scenario was compared with the results of Craig and Mann , who conducted a techno-economic study of various options for a BIGCC power plant fuelled by wood. Options explored included various gasification scenarios, such as pressurized versus near-atmospheric conditions, and direct versus indirect heating. Since this plant was an autonomous facility, the energy demands of the sugar mill were discarded in order to remodel the BIGCC-EE scenario as an autonomous facility, so that the results could be comparable. The net electrical efficiency of the autonomous BIGCC-EE was 34.2%, which compared well with the value of 37.9% obtained by Craig and Mann . The efficiency of Craig and Mann  is expected to be higher because the combined steam cycle of the pilot plant operated at the much higher pressure of 100 bar, which was a more efficient system for the steam cycle than the steam cycle in this study, which operated at a steam pressure of 60 bar. Thus a greater contribution was expected from the steam cycle section in that study . Furthermore, Craig and Mann  assumed an efficient design of the gasifier that assured complete conversion of the biomass, whereas this study considered a conservative case where only 90 to 95% of the biomass was converted. The minimum electricity price (MEP) determined by Craig and Mann  was 0.07 US$ per kWhr on a currency base of 1996, which is equivalent to a 2012 price of 0.132 US$ per kWhr. This was attained under the economic constraints of a biomass price of 78.67 US$ per dry ton (US$/d-ton) and an IRR of 10%. With such constrains, the exclusive BIGCC-EE of this study was shown to obtain a MEP of 0.10 US$ per kW/hr. The discrepancy then arises from the maturity of the capital cost estimates, as Craig and Mann  used very early stage estimates of BIGCC systems (1990), which was 51.97% more than the modern estimate (2008) used in the BIGCC scenarios of this study. The results of the CD/CHPSC was compared to the feasibility assessment of an integrated ethanol facility conducted by Macrelli et al. , where the cellulose fractions of bagasse and trash residues were considered for second generation ethanol production. The net export efficiency of the integrated component, based on the export of electricity and lignocellulosic ethanol generated, was 35.2%, which is significantly higher than the efficiency of 25.57% determined for the CD/CHPSC. This arose because Macrelli et al. considered the cellulose fraction for ethanol production, which constitutes 35 to 40% of the considered biomass, as opposed to hemicellulose which only constitutes 20 to 24% of the considered biomass (see Table 3). Thus, a greater fraction of the biomass was efficiently used for the production of the energetic product. 1Average of measurements for South African bagasse [47, 48]. 2Composition taken Oliveira et al, . The MESP (Minimum Ethanol Selling Price) that was determined for the lignocellulosic ethanol by Macrelli et al. was 0.97 US$ per litre, under the economic constraints of a sugarcane trash price of 26 US$ per dry ton and an IRR of 10%. This MESP included a penalty of 0.12 US$ per litre for the reduction of export electricity when compared to electricity exports of an autonomous first generation facility and an enzyme cost of 0.38 US$ per litre. Thus, the MESP was adjusted to 0.47 US$ per litre by disregarding the penalty and enzyme cost, for a consistent comparison with this study. Under the economic constraints in the study of Macrelli et al. , the CD/CHPSC obtained a MESP of 0.43 US$ per litre, which compares well with the adjusted MESP of Macrelli et al.. This comparison also shows that although a process converting cellulose to ethanol is more energy efficient, it is less economically viable due to the major cost associated with the enzymes needed to hydrolyse cellulose. Figure 4 and Figure 5 show the economic sensitivity of the economic parameters to certain parameters that were deemed to have an uncertainty in their specification. The sensitivity was carried out with the pricing strategy that considered the minimum selling prices of electricity and ethanol. The coproduction scenarios with the highest profitability were the VD/BIGCC and the CD/CHPSC, which were also the best indications of advanced and immediate technologies available, respectively. Thus, these scenarios were subjected to sensitivity analysis. Since the CD/BIGCC and VD/CHPSC were not as technically and economically viable, they were not included in the sensitivity analysis.With regards to the sensitivity of the overall ethanol output on profitability (Figure 4), a yield improvement of 10% generally increased the measured IRRs by 1.89%, which improved the IRR of the most optimal ethanol scenarios to 31.29 ± 0.29%. Alternatively, a yield that worsened by 10% reduced the IRRs by 2.02% on average to 27.38 ± 0.39%. The most important observation here is that a reduced yield had only increased the risk of the IRR receding below 25% by a margin of 5.68% at most (for the CD/CHPSC). 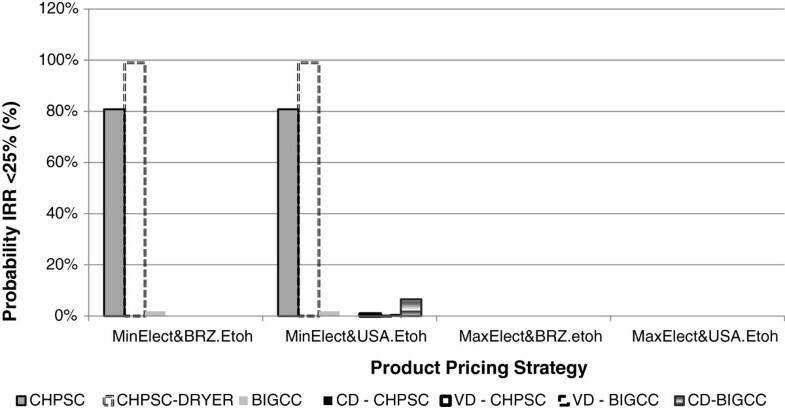 Thus, the most economically viable ethanol scenarios remained desirable for investment from the private sector when suboptimally performing technology was considered.An increased estimate for the BIGCC installed costs of 10% (Figure 5) had increased the CAPEX for the BIGCC-EE by 10% and the VD/BIGCC by 7.35%. However, since the VD/BIGCC had the highest CAPEX originally, the effect of an increased installed cost was most prominent on this scenario since its IRR was reduced by a further extent than that of the BIGCC-EE. Given a reduction in the IRR of the BIGCC-EE of 1.31%, it is still far more viable than the CHPSC-EE scenario. Regarding the risk around private investment, the VD/BIGCC is still a viable option, as the probability of the IRR receding 25% was only 3.10%. Sensitivity of the ethanol yield on the VD/BIGCC and CD/CHPSC scenarios. IRR – Rate of Return; Pr(IRR<25) – probability of IRR falling below 25%. 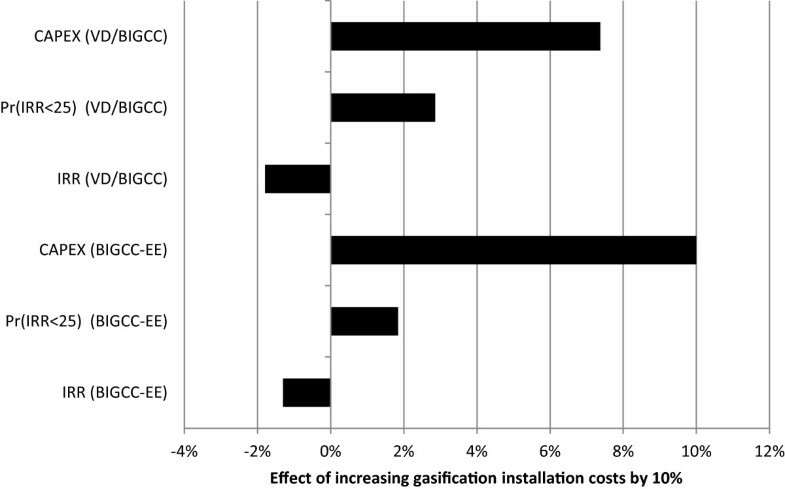 Effect of pessimistic installed estimate of gasification costs on the BIGCC-EE and VD/BIGCC scenarios. IRR – Rate of Return; Pr(IRR < 25) – probability of IRR falling below 25%; CAPEX – Capital Expenditure. Ethanol coproduction with electricity generation has been shown to have greater exporting energy efficiency than exclusive electricity generation. This was demonstrated in the context where the status of the electricity generation technologies is advanced, but where the technological status of ethanol production is at a conservative level, considering the modest conversion of sugars to ethanol using the detoxified hydrolysates. If a minimum pricing scenario on the ethanol and electricity products is considered, ethanol coproduction with electricity generation is considerably more profitable than CHPSC power plants, but on par with BIGCC power plants. The advantage of ethanol coproduction would become more pronounced as fermentation technology develops and matures as expected, and it would also become attractive for private investment. If the fermentation of hemicellulose hydrolysates (though successful on a bench-scale) can demonstrate that a pilot-scale conversion of at least 82.5% sugar to ethanol can be attained, it will confirm the technology proposed. While a high premium on electricity would promote exclusive electricity production when ethanol prices are at a minimum, it is not likely that these premiums on electricity would be attained under the current regulations for renewable electricity in South Africa. The reason is because even at lower premiums, the IRR of the BIGCC-EE was 30%, whereas the prices of electricity for IPPs are regulated to allow for a maximum IRR of 17%. The study showed that at the current scale, additional capital investments for more energy efficient technology is only justified when it effects a significant improvement in energy efficiency, as shown when BIGCC technology is used instead of the direct combustion in the ethanol coproduction schemes. Furthermore, it was found that when a more energy efficient technology only effected a minor improvement in energy efficiency, such as VD applied in the ethanol coproduction process or biomass dehydration in a combustion process, the economic returns did not justify the capital investment. There would be situations however, where the energy intensity of the process would demand the implementation of such measures, either to reduce process steam demand or improve steam generation to a feasible operating range. All of the scenarios analyzed in the present study assume that the steam demand of the sugar mill itself will be 0.4 tons per ton of cane processed The capital investments required to upgrade existing sugar mills in South Africa to achieve this level of energy efficiency has been estimated at US$ 17.32 million [3, 50] (in 2012) for a 300 ton per hour crushing rate. The technical measures included the optimisation of imbibitions rate to reduce the amount of evaporation needed ; the conversion from the batch pans to continuous pans and reduce the pan movement water [3, 9, 50]; using a five-effect evaporator where vapour is bled to the vacuum pans at a lower effect ; optimisation of the flashing of condensates for steam recovery  and finally; electrifying the turbine drivers [3, 4]. The cane crushing capacities of mills in South Africa range from 190 to 600 tons per hour [51, 52], and thus the representative average of 300 tons per hour was assumed for the present study. Based on a fibre content of 0.14 kg/kg of cane , 42 tons per hour of bagasse would be generated from the cane crushing activities for energy generation. Of the total harvesting residues, amounting to 1.167 kg per kg of bagasse , 50% of this amount would be collected and co-fed with all the bagasse into an ‘energy island’ in the mill to generate the energy requirements of the mill (40% steam on cane  and 41.64 kWe  per ton of cane) and the export energy products. The composition of the residues is shown in Table 3. Nsaful et al. 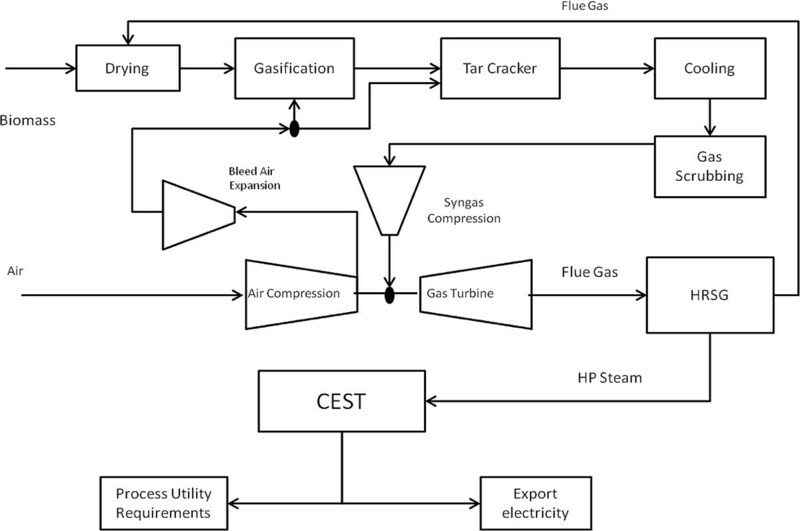 developed a flow sheet for the conversion of bagasse from a sugarcane milling operation to steam and electricity with a high pressure steam system using combustion (Figure 6). They found that the optimum boiler pressure for efficient electricity generation was 82 bar. Based on the net amount of export electricity, the electrical generation efficiency was 21.5% for 82 bar and 20% for 63 bar. Conversations with experts in the South African sugar industry indicate that the design pressure for boilers which will be used to retrofit the sugar mills is 86 bar. Consequently, a boiler pressure of 86 bar is assumed in this study. Conventionally, biomass would enter the combustor at about 45% moisture, though it could also be dried with flue gas to improve the boiler efficiency, with additional capital charges. The minimum acceptable moisture content for bagasse is 30%, so as to avoid self-ignition and/or a dust explosion . Excess air is provided to the boiler, which has been preheated to 250°C  by the stack gas, to improve the overall efficiency. The amount of air in excess is determined to ensure a minimum oxygen content of 6% in the flue gas, as per environmental regulations . Combustion with High Pressure Steam cycles (CHPSC) flow sheet. (CEST – Condensing Extraction Steam. The boiler would generate superheated steam at about 515°C  and 86 bar that would be expanded in a CEST to generate electricity. The intermediate pressures in the CEST are 13 and 4 bar, and the final vacuum pressure is 0.2 bar . The vacuum steam would then be condensed and returned to the steam cycle. Steam for the mill would be extracted from the CEST at 4 bar. Regarding the performance of the turbines, the isentropic efficiency was 85% while the combined mechanical and electrical efficiencies were set at 96.06% (i.e. 98% for electrical and 98% for mechanical ). The general flow sheet of the BIGCC system (Figure 7) for biomass conversion to electricity was adapted from models developed by the NREL [46, 58] and previous reports [59–61]. The combined bagasse and trash would be initially dried to a moisture content of 10 to 15% with exhaust flue gasses [59, 60]. The moisture content within the biomass would serve as the gasification control agent  since steam injection is generally not considered for gasifier applications in the BIGCC systems. The amount of air added to the circulating fluidized bed (CFB) gasifier in the BIGCC system is to ensure the highest possible calorific value of the syngas without an excess of tars. To initiate tar cracking, the gasifier is required to be operated at 800°C. This is achievable when the ratio of the air supplied to the stoichiometric amount for complete combustion (equivalence ratio) is 0.25 to 0.3 . The syngas would then enter a cyclone to remove particulate matter before entering the CFB tar cracker, where additional air is added to increase the temperature to 920°C  for cracking to occur with a dolomite catalyst . Biomass Integrated Gasification and Combined Cycle flow sheet. (CEST – Condensing Extraction Steam Turbine; HRSG – Heat Recovery Steam Generator; HP Steam – High Pressure Steam). After tar cracking, the temperature of the syngas would be reduced to 288°C in order to condense the alkali species for removal with any other particulate matter in a filter bag . The syngas is further cooled to 97°C before it is scrubbed with water to remove the nitrogenous and sulfurous compounds for the protection of downstream equipment, and to prevent nitrous and sulfurous oxide emissions [46, 60]. The scrubbing also humidifies the syngas, which assists in the control of the temperature in the gas turbine . The syngas is compressed in a multi-stage compressor (two compressors with an inter-stage cooler in-between) to 20 bar, which is 4 bar above the combustion pressure of the gas turbine , in order to allow for the pressure drop across the feed nozzle . At the inter-stage cooler, the syngas was cooled to 97°C at an intermediate pressure of 6 bar, which was determined by the optimization procedure of Polyzakis et al.. The air required for the gas turbine would be compressed in the compressor chamber of the gas turbine, and is fed at a mass ratio of 1:5.14 to the syngas . In order to compensate for the extra volumes of dilution gasses in the syngas that is not found in natural gas, such as CO2 and nitrogen, air would be bled from the compressor chamber before the air enters the combustion chamber [46, 60, 64] since the gas turbines are designed for natural gas which does not contain inert gasses. The rate at which air is bled amounts to 13.3% of the air fed to the compression chamber, which is in excess of the air demands of the gasifier and cracker. The bleed air would be expanded through a turbine to atmospheric pressure to improve the net electricity output . Once expanded, the air would be preheated to the gasifier temperature to be used to feed the gasifier and tar cracker. Regarding the efficiency of the gas turbine, the compressor section has a polytrophic efficiency of 0.87% and the gas turbine has an isentropic efficiency of 89.77% . The mechanical and electrical efficiencies are both set at 98% . The combustion exhaust gas leaves the combustion chamber at about 1100°C and is expanded to 1 bar in the turbine section to generate the bulk of the electrical output by driving the generator. The heat of exhaust gasses of the turbine is captured in a HRSG to generate steam at 60 bar for the ‘combined’ steam cycle [58, 60, 61]. The superheated steam is generated with water that had been preheated with waste heats from the BIGCC system, as determined by PPA. The superheated steam is then expanded in a CEST to provide the steam demands and additional electricity. The exhaust gas of the HRSG has a temperature of 200°C and is used to dry the biomass that entered the BIGCC system . 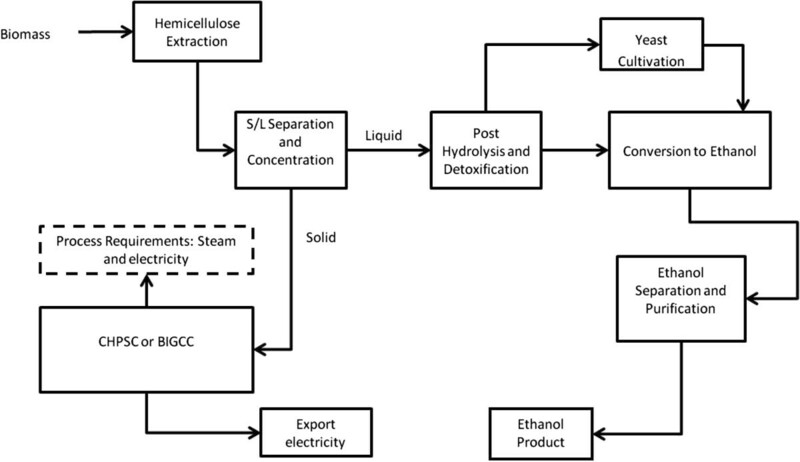 A general overview of the process flow sheet for the coproduction of ethanol and electricity is presented in Figure 8. Regarding the process step for pretreating the biomass for hemicellulose solubilization, the two methods that have been established for this purpose are dilute acid hydrolysis (DAH) and steam explosion (STEX). As shown in Table 4, the DAH process typically provided a lower yield of hemicellulose sugars than the STEX and only operated effectively at solid contents of 20% and below. STEX had been shown to operate effectively at 50% (Table 5), which implies that the energy requirements for DAH were much higher due to the large volumes of water to be evaporated to concentrate the hydrolysate for efficient downstream processing [47, 65]. Thus, STEX was selected as the technology for hemicellulose solubilization. After pretreatment, the pretreated slurry is washed and filtered to recover the solubilized sugars as a filtrate from the solid residue (containing the cellulose and lignin fractions) that is converted to heat and power (via CHPSC or BIGCC). The sugar recovery to the filtrate was conservatively estimated at 80%, even though recoveries as high as 91% have been reported in the literature . Regarding the gasification of residue from steam explosion, it produces a syngas with a higher calorific value than that produced from raw biomass, but the gasifier must be slightly bigger, to accommodate the lower reactivity of the pretreated biomass . 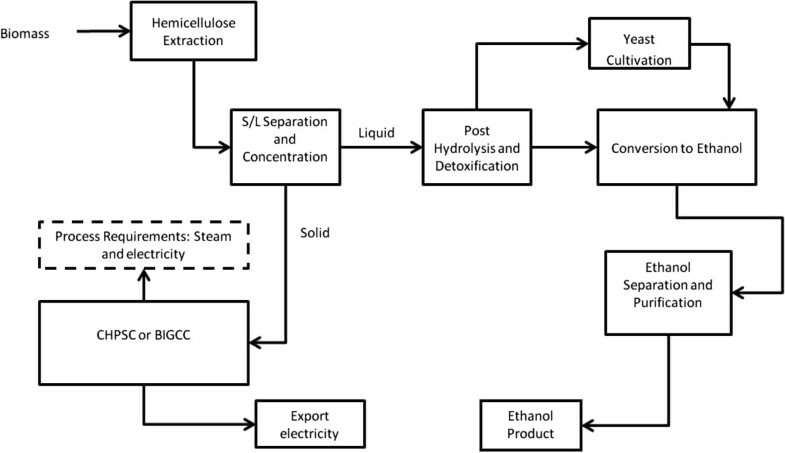 Ethanol coproduction flow sheet. (BIGCC - Biomass Integrated Gasification and Combined Cycles system; CHPSC – Combustion with High Pressure Steam Cycle; S/L Separation – Solid Liquid Separation. 92 g/l, as per the hydrolysate in Kurian et al. STEX without catalysis requires a secondary hydrolysis of the hydrolysate to convert the oligomers to fermentable monomeric sugars  by treatment with sulfuric acid at a level of 0.5% (wt) in solution at 120°C for 20 minutes . This two-step process is advantageous over the catalyzed STEX (and DAH) because catalysis is intended for improving enzymatic digestibility (which is of no significance in this study) rather than the solubilisation of hemicellulose . Furthermore, the yield of solubilisation with no catalysis is less variable, as shown in Table 6 and lastly, the costs of purchasing or producing SO2 and effective impregnation equipment are avoided. 25 years, with 9 operational months per year. The salvaging value is 20%. Straight line to salvaging value. To simplify the analysis, an equity of 100% was assumed [28, 47]. It was further assumed that capital will be fully paid after construction. The theoretical conversion of hemicellulose of the mixed biomass is assumed as 88%, which is the weighted average obtained with bagasse [72, 73] and trash  (at a feed ratio of 1:0.583) at temperatures ranging from 200 to 210°C with a STEX time of 10 minutes. At such conditions the formation of degradation compounds is significant enough to inhibit the fermentation organisms , and thus the neutralization of these compounds by detoxification is necessary. The mode of detoxification would be alkaline treatment [24, 25, 28] at temperatures below 30°C so that no sugar loss occurs . While detoxification has been criticized as an unnecessary economic hurdle in previous process evaluations, it has been shown experimentally that detoxification improves the yield of fermentation by 20 to 25%, even if inhibitor resistant strains are used [25, 80]. In this study, ammonium hydroxide will be used to carry out detoxification  in order to avoid the environmental and operational issues associated with over-liming. The yield of ethanol on sugar and other fermentation parameters for the present study are presented in Table 5, which are conservatively assumed based on previous performances in literature [26, 27]. To ensure this yield, fed-batch fermentation is adopted, since this mode of fermentation can be 1.5 times more efficient than batch fermentation . With regards to the hexose sugars, which resulted primarily from the cellulose content of the sugarcane trash, the conversion will be assumed as 90% since the yeasts consume these sugars at a much faster rate than the pentose sugars . After fermentation, the beer product is purified in the refining section to produce anhydrous ethanol. The beer is initially flashed at 86°C and 0.83 bar to remove the carbon dioxide (CO2), and the flash gas enters a knockout drum at 1.1 bar to condense ethanol that has evaporated [47, 65, 83]. The gas from the knockout drum is then combined with the fermentation vent stream and enters a scrubber to ensure the maximum recovery of ethanol [47, 65, 83]. The effluents from the scrubber and knockout drum are combined with the beer stream from the initial flash and fed to the beer column, which produces a vapor phlegm  that contains ethanol at 40 to 50%. The phlegm is then fed to a rectifier column that produces hydrous ethanol phlegm of 91% . The hydrous ethanol phlegm is dehydrated by molecular sieves to produce ultra-pure ethanol product of 99.7% [47, 65, 83]. In a variation of the configuration described, the beer column can operate at a vacuum pressure of 0.2 bar, which allows for the heat required by the reboiler of beer column to be supplied by the condenser of the rectifier. Dias et al. had shown through pinch-point heat integration that the steam demand of the refining section of an ethanol distillery can be significantly reduced if such a strategy is employed. This variant would, however, require a vacuum pump to actuate, which implies that the economic impacts of the lower steam demand would need weighing-up with the higher electricity and capital requirement. 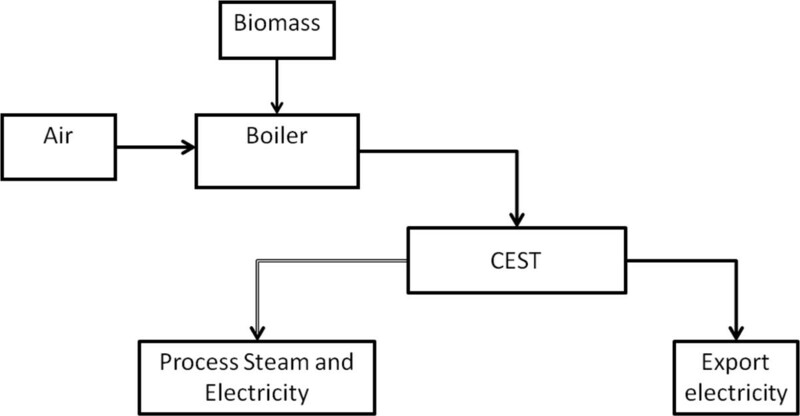 For electricity and steam generation, technological variants included biomass integrated gasification with combined cycles (BIGCC) and combustion with high pressure steam cycles (CHPSC). Regarding ethanol purification, the technological variants included conventional distillation (CD) and vacuum distillation (VD). 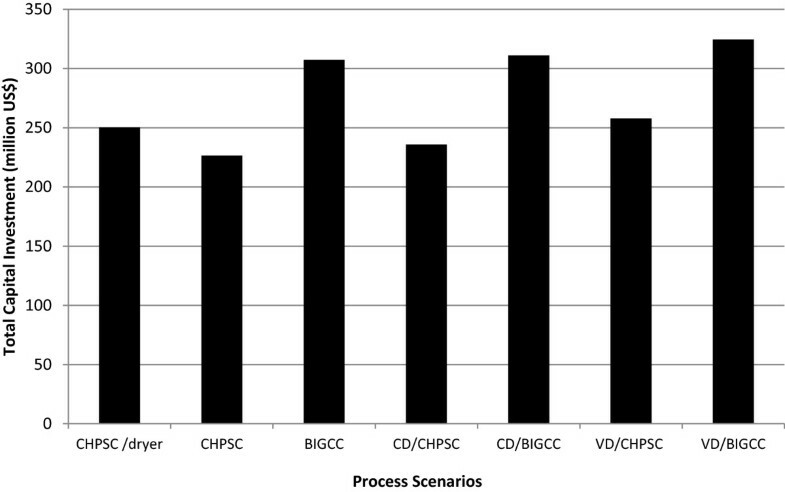 Therefore, from these process technologies, the alternative process scenarios that were modelled as all possible combinations of the process options included BIGCC exclusive electricity generation (BIGCC-EE); CHPSC exclusive electricity generation (CHPSC-EE); CD/BIGCC for coproduction of ethanol and electricity; CD/CHPSC for coproduction of ethanol and electricity; VD/BIGCC for coproduction of ethanol and electricity and VD/CHPSC for coproduction of ethanol and electricity. The simulation of all scenarios were completed in Aspen Plus® (Aspen Technology, Inc., Massachusetts, USA)  by modelling the flow sheets with the relevant design parameters discussed in the section dealing with process technology considerations. Reactors were simulated as the stoichiometric reactor ‘RSTOIC’ using conversions evaluated from available experimental data [28, 37, 47, 65]. The gasifier in the BIGCC scenarios was modelled as a combination of an adiabatic combustor and equilibrium reactor that determines that determines the gas composition by minimizing the Gibbs Free Energy ’RGIBBS’ , since the composition of the syngas is close to the equilibrium values [46, 59, 85, 86]. Regarding thermodynamic properties, the Non-Random Two-Liquid model (NRLT) for electrolyte systems (ELECNRTL) was used whenever there were electrolytes to consider, and the NRLT was used to model the separation systems [29, 47]. The utility requirements were determined with PPA, by importing heat duties of streams and flash drums determined by the Aspen Plus® simulations into the IChemE pinch analysis spreadsheet  which were used to calculate the hot and cold utilities according to the methods of Kemp  and March . After the utility requirements were taken into account, the net export efficiency (η) was calculated as the combination of the net export of electricity (Enet) and calorific value of the ethanol fuel (F) relative to the calorific input of the biomass (m*HHVbiomass), as shown in Equation 1 (the standard unit used for these energy quantities was MJ/hr). Results from the process models were used in the economic evaluation models for each of the scenarios considered, in accordance with established process evaluation techniques . The information emanating from these models were used to calculate the key economic variable (KEI), namely, IRR . A Monte Carlo simulation was super-imposed on the financial evaluation models in order to create a financial risk assessment whereby the input of certain economic variables into the financial statements would be based on probabilistic distributions that are determined by historical data. This process is then repeated for a large number of iterations and the KEIs generated from the iterations are stored for aggregation in a statistical assessment. The methods followed for these simulations have been described in detail by Richardson et al. [34, 35, 78] and by the authors of the current study [36, 37]. The software used for carrying out the simulation was the Simetar Risk Analysis Software (Simetar, Inc., Texas, USA) . The economic parameters that define a South African context under which the financial risk of all processing scenarios were evaluated are given in Table 6. The capital costs of generic equipment such as pumps, process drums and turbines were estimated with the Aspen Icarus® (Aspen Technology, Inc., Massachusetts, USA) estimator. For all the major or specialized equipment in the ethanol process model, the costs were based on vendor and literature based quotes, such as those in Humbird et al. for steam explosion, hydrolysis equipment and filter presses; Aden et al. for detoxification equipment, cooling water mains pump and cooling tower system; Bailey  for surface condensers; Ridgway  for vacuum pump; Al-Riyami et al. for heat exchanger costs and finally, Craig and Mann  for flue gas biomass dryer. The cost of the high pressure boiler systems was provided by experts in the South African sugar industry. However, for the BIGCC it was seen that capital estimates tended to be based on whole plant costs in the literature [16, 93]. Many of these estimates could be traced to vendor quotes from the period when the costs of BIGCC systems were still pioneer costs [13, 16, 93]. Therefore, the most relevant estimate was found in the representative costs in the Report on Combined Heat and Power, of the Environmental Protection Agency of the USA (EPA CHP) , which was based on vendor quotes of modern equipment costs. In this study, nominal economic variables’ refers to specific prices and indices that form the basis of operating costs, incomes and interest-based transactions. These specific values were either determined from the literature or from published databases and are listed in Tables 7 and 8. The variables are treated as ’static’ variables (Table 7), which means that the basic prices in year one of the assessment was taken as an average value estimates and inflated with the projected Producers Purchases Index (PPI) to predict the future value. The ‘stochastic’ variables (Table 8) were used to generate a multivariate empirical function, from which the future values were iteratively projected for each year in the evaluation in the Monte Carlo simulation. 1Amortized cost for upgrading a South African mill to 40% steam on cane for liberating bagasse. Regarding the price of second generation ethanol, uncertainty exists because the current pricing of the South African biofuel strategy does not explicitly include second generation fuels . Thus, the price of ethanol was either based on data given for ethanol prices in the USA, or based on data describing Brazilian (BRZ) ethanol prices. Given the uncertainty in the selling price of the export electricity, an upper and lower premium was calculated and applied on the base electricity prices projected from the probability distribution. These premiums were calculated on the minimum and maximum prices for renewable electricity of the South African Renewable Energy bids, which had 2012 based prices of 0.113 and 0.175 US$ per kW/hr respectively . Since biomass based energy is continuous and supplies energy for peak hours, a bonus price of two times the renewable energy price is allowed for four hours per day , which thus raises the average renewable prices to 0.139 and 0.216 US$ per kW/hr. Relative to the base electricity price (2012 price) in Table 8, the upper and lower premiums amount to 31% and 103% respectively. With the two possible renewable electricity premiums and two sets of ethanol price data, there would be four possible pricing strategies. Each strategy is considered as a set of parameters under which separate sets of stochastic evaluations of the process scenarios will be conducted. These four pricing strategies are: 1) minimum electricity premium and ethanol prices based on Brazilian data, 2) minimum electricity premium and ethanol prices based on USA data, 3) maximum electricity premium and ethanol prices based on Brazilian data, and 4) maximum electricity premium and ethanol prices based on USA data. The modern capital estimates of BIGCC carry some uncertainty, in that they might be too optimistic. Thus, in order to account for the possibility of a more pessimistic capital estimate, the capital estimates of the BIGCC power plant equipment was increased by 10%, prior to factoring in balance of plant costs (BOP) and project contingencies. Accordingly, a separate stochastic simulation of the BIGCC-EE, CD/BIGCC and VD/BIGCC scenarios was carried out to evaluate the impact of the pessimistic capital estimate. There is also uncertainty in the yield of ethanol from the hydrolysate, as a very sophisticated organism could yield more ethanol without the need for detoxification, hence negating the associated costs. Furthermore, it is also possible that suboptimal hemicellulose extraction could result in a loss of ethanol. Thus, two sensitivity scenarios of the most profitable coproduction scenarios were simulated. They include: (1) where the overall ethanol yield is decreased by 10% to account for the suboptimal hemicellulose extraction, and (2) where the overall ethanol yield is increased by 10% to account for a possibility of a sophisticated fermenting organism which will further discard the costs associated with detoxification. Accordingly, the economic sensitivity to these variations in process parameters was determined using separate stochastic evaluations. The authors would like to thank Chair of Energy Research at Stellenbosch University, funded by the Department of Science and Technology, for providing financial assistance. AMP was the primary investigator into the work. He performed all simulations of the various processes and economic evaluations. He also completed the interpretation of results and was the primary author of the written text. MCA was the internal reviser who checked the paper critically for inconsistencies in the text and structure. He also gave assistance in the structuring of the paper. JFG is the study leader of the research group, reviewed the paper internally and approved the submission from our department. He is also the corresponding author. All authors agree to be accountable for all aspects of the work and will ensure that questions relating to accuracy and integrity be appropriately investigated and resolved. All authors read and approved the final manuscript.